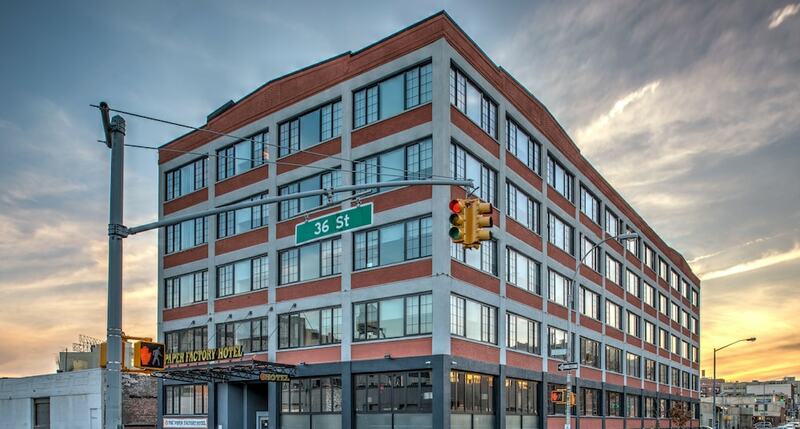 Located in Long Island City, The Paper Factory Hotel is within a 15-minute drive of The High Line Park and Roosevelt Island. This 4-star hotel is 2.8 mi (4.5 km) from Memorial Sloan-Kettering Cancer Center and 2.9 mi (4.7 km) from 5th Avenue. Enjoy recreation amenities such as a fitness center or take in the view from a garden. This hotel also features complimentary wireless Internet access, a television in a common area, and tour/ticket assistance. Satisfy your appetite at the hotel's coffee shop/café, or stay in and take advantage of the room service (during limited hours). Wrap up your day with a drink at the bar/lounge. Buffet breakfasts are available daily from 7:00 AM to 10:00 AM for a fee. The hotel offers a coffee shop/café. A bar/lounge is on site where guests can unwind with a drink. This 4-star property offers access to a business center and limo/town car service. A computer station is located on site and wireless Internet access is complimentary. This business-friendly hotel also offers a fitness center, tour/ticket assistance, and multilingual staff. The Paper Factory Hotel is a smoke-free property. Bar - Onsite bar. Guests can enjoy drinks at the bar. Open daily.